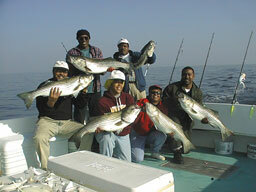 Mike Fox (second from left) just can't get in enough fishing for big rockfish. From left to right, that's Aaron (Mike's son), Mike, Asher, Jeff, Cliff, and Mike Number 2. 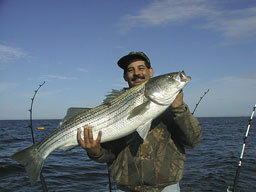 Rockfish to 41 inches were caught November 28 by the Fox crew while "riding the Worm". And the "Fox Man" with his 40 incher. We didn't think he'd mind, so we've included a photo of Marty Simounet, Captain of the charter boat Kyran Lynn, with a beautiful 18.5 lb. 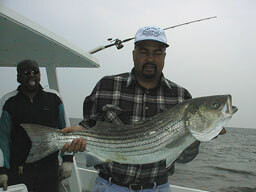 slammer blue caught by members of his crew on November 28 near Point Lookout. We all hope to see more of these great fighters in the coming weeks. 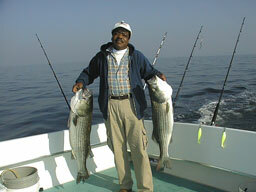 The fishing near Point Lookout continues to be awesome. 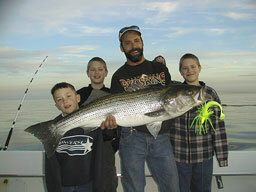 Here's Chris Ansel and crew with a 44 inch monster rockfish, caught on November 21 with Captain Drew on the "Worm". 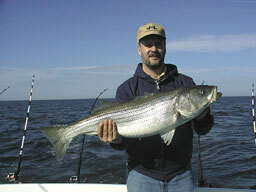 Here's Mike Fox with a beautiful big rockfish, caught on November 21. And here's John, a member of the Fox crew, with a 43 incher. And Mike, also fishing with the Fox crew, with a pair of 36 inch rockfish caught on a double parachute rig after a twenty minute battle. 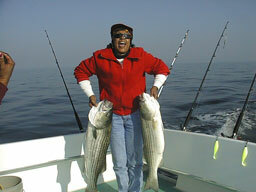 And finally, here's Judy of the Fox crew with one of her nice rockfish. The grade of fish is nothing short of outstanding. And from November 20 here we have Mark Balsamo and a 45 inch monster rockfish, which was one of six fish hooked up simultaneously! Talk about dancing in the cockpit, with rods going over and under and around other rods. 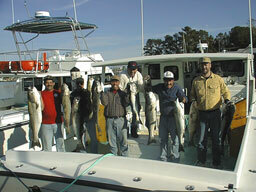 And finally, the entire Balsamo crew with a load of big rockfish. 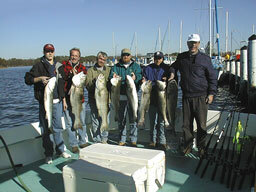 Here we have the Mike Easterday (second from left) crew of November 19 with their limits of real fine rockfish. 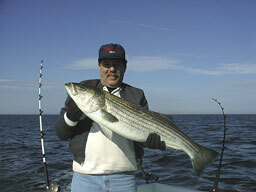 And another member of John's crew with a moose of a rockfish. 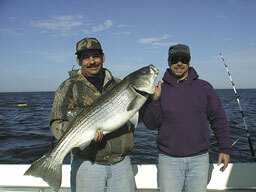 We promised Russell Coates (far left) some big rockfish and Captain Drew delivered on November 13. Standing, that's Frank and Bill, with Juliet, Jarnice, and Leo kneeling. 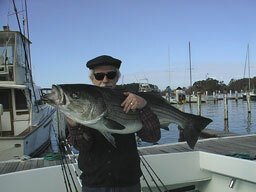 Here's a closeup of Russell with one of his 38 inch rockfish. 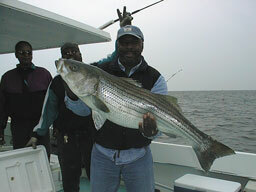 And Frank with his largest ever rockfish, a 40 inch beauty. 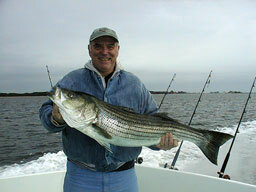 Here's Harry Coulombe and his 40 inch rockfish, caught on the "Worm" November 12 off Point Lookout. 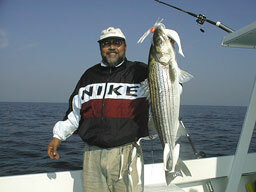 Even with his eyes closed (again), we still recognize Jeff Wallace with one of his big rockfish from November 11. 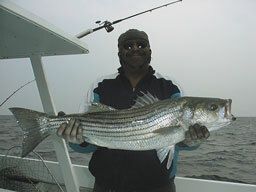 Here's Dwight of the Wallace crew with another beautiful rockfish. 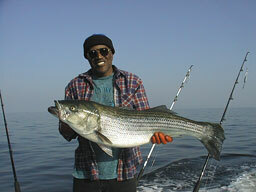 And here's Leroy from Jeff's crew with one of his large rockfish. Wow! 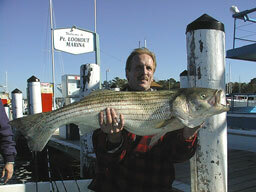 The "Worm" started off November fishing out of Point Lookout Marina in a big way. 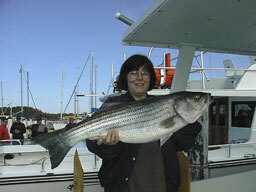 Shown with Alex Paolucci and her largest rockfish ever is our Captain with a 45 inch, 42 pound whopper. Here's Alex cranking for all she's worth on the other end of that 45 inch trophy. She refused the fighting belt and other offers of assistance. Congratulations Alex! It seems hard to believe, but the smallest of these fish was 32 inches; others caught by the Paolucci crew of November 6 include 39, 42, and the 45 incher. 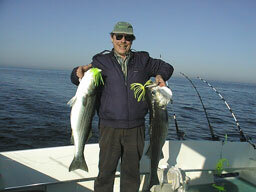 Here's Chuck Gray on the left and Nordie with a couple of rockfish in the mid-30 inch class, both of which were their largest ever. 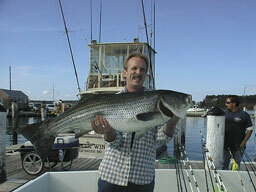 And here's Mike Herbert, who caught rockfish up to 42 inches, with one of his fine rockfish. 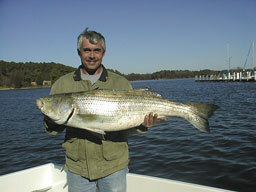 Chuck's largest was bested again when he landed this 39 inch beauty. 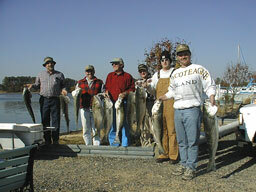 These quality fish all took big baits trimmed with 9 inch shad. But then again, when you're after big fish, use big baits.